Taking a bold step to redefine the SUV market in Asia Pacific and beyond, Ford unveiled the new Ford Everest, a technologically advanced, stunningly capable and refined seven-seat SUV that will be launched in 2015. 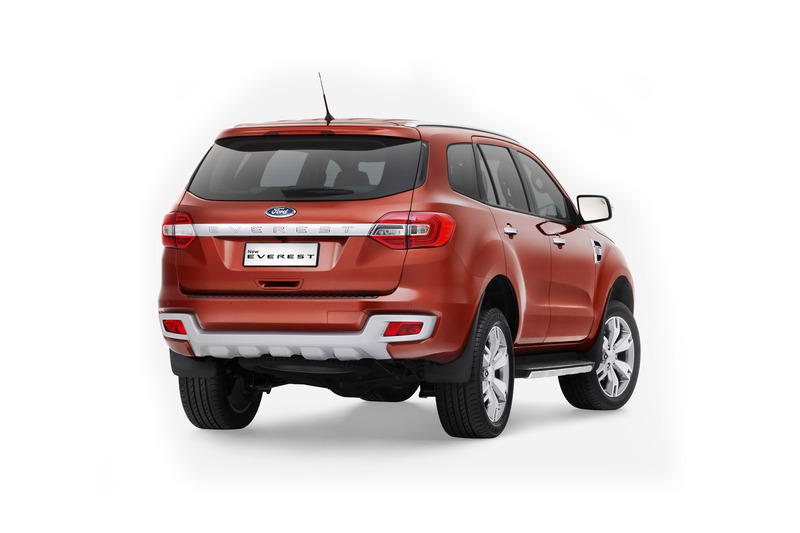 In Asia Pacific, the Ford Everest will be available in nine markets: China, Australia, New Zealand, India, and markets across the ASEAN region. Ford will also introduce the rugged SUV to Sub-Saharan Africa and South Africa in 2015. 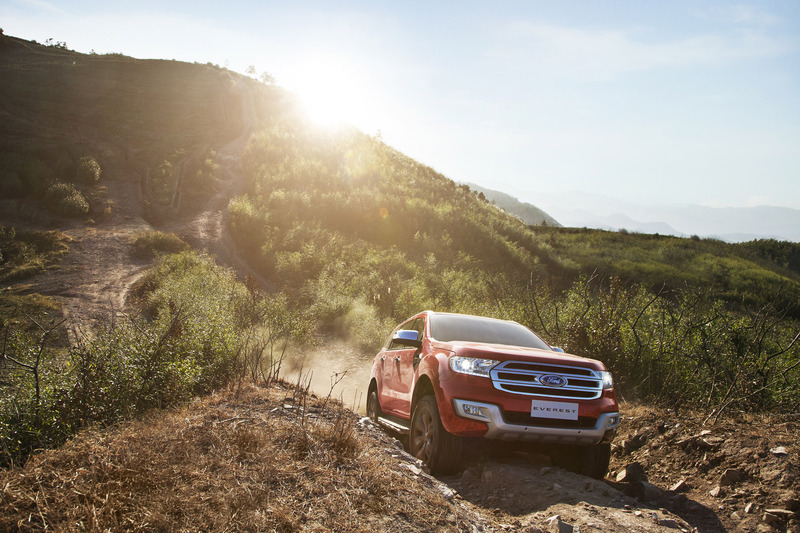 "The new Ford Everest is an exceptionally versatile vehicle, equally prepared for the everyday commute as it is for the most extreme off-road terrain," said Dave Schoch, president, Ford Asia Pacific. "The Everest's unique blend of tough capability and exceptional comfort is going to resonate with drivers across Asia Pacific and around the world." With a rugged, sculptural design that reflects its unshakeable toughness and technological prowess, the new Ford Everest blends strength, smart features and style to bring consumers a tough and versatile SUV with true off-road capability. In addition to surprising and delighting fans of rugged off-road SUVs, the new Ford Everest embodies Ford's fun-to-drive DNA to deliver rewarding and dynamic on-road handling, offering no compromises on refinement and comfort. "The Ford Everest will help to expand our product footprint in the region with a tough and refined vehicle that enables drivers, their families, friends and colleagues to go anywhere comfortably - whether on urban roads or far off the beaten track," said Trevor Worthington, vice president, Product Development, Ford Asia Pacific. "From the EcoSport to the Everest, our SUV portfolio in Asia Pacific offers something for everyone." Led by Ford's Asia Pacific design and product development teams, and making use of Ford's global SUV expertise, the new Ford Everest builds on the reputation of the current Ford Everest, which is praised for its durability and versatility. The new Ford Everest will be available in both rear-wheel drive and four-wheel drive variants depending on specific market demand. "The new Ford Everest represents an epic commitment on the part of the Ford Motor Company to meet and exceed high customer expectations," said Worthington. "From the very beginning we set aggressive targets, and with the Ford Everest we have truly raised the bar for this type of vehicle in design and capability, with advanced technologies for a smarter, safer and more capable vehicle at a very attractive price." 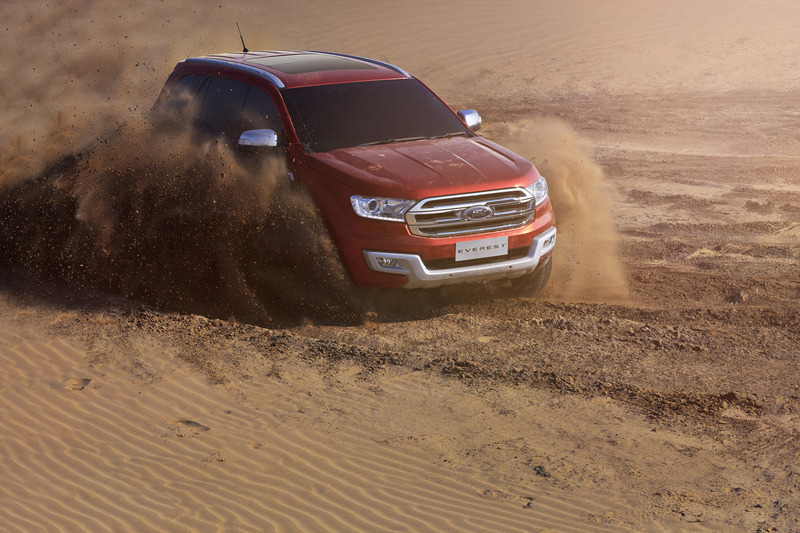 The new Ford Everest was designed from the ground up with the durability to take on the most inhospitable environments. One of the toughest SUVs in its segment, the Ford Everest has a true body-on-frame design, assuring the torsional strength required for challenging terrains. Together with an intelligent four-wheel drive system, an active transfer case with Torque on Demand, Terrain Management System, and best-in-class ground clearance of 225 mm and water-wading capability of 800 mm, the Ford Everest helps drivers navigate difficult terrain with ease. For ultimate capability, the advanced Terrain Management System gives drivers four preset settings - Normal, Snow/Gravel/Grass, Sand and Rock- that alter the vehicle's throttle response, transmission, intelligent four-wheel drive system and traction control to confidently tackle any situation. For extreme off-road environments, drivers can manually lock the transfer case in low-range four-wheel drive mode for increased control. These impressive off-road credentials are paired to a new level of ride quality and dynamic handling beyond what consumers have come to expect in a rugged SUV. Thanks to its coil spring front and rear suspension and a Watt's linkage on the rear axle, the new Ford Everest provides a comfortable, stable ride with agile and predictable handling on the road, keeping the promise of Ford's fun-to-drive DNA. 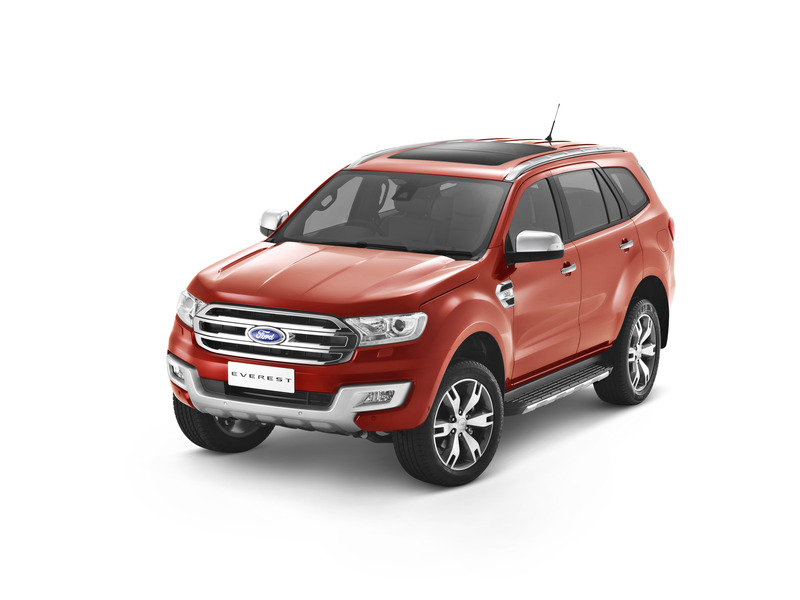 Ingeniously packaged with "up for it" functionality enabling extraordinary journeys, the new Ford Everest is one of the most technologically advanced off-road SUVs ever made, and builds on Ford's global expertise in the utility segment. The latest generation of Ford's in-car connectivity solution, SYNC 2, lets drivers use natural voice commands to control the car's entertainment system, climate controls and connected mobile devices more easily than ever before. SYNC 2 also boasts an 8-inch touchscreen with color-coded corners for easy menu navigation. The new Ford Everest also offers a number of segment-first technologies, including Curve Control, designed to help drivers maintain control when approaching turns too quickly; Lane Departure Warning and Lane Keeping Aid, two technologies that help prevent drivers from unintentionally drifting out of a lane; and Blind Spot Information System (BLIS) with Cross Traffic Alert, which informs drivers when there is a vehicle in their blind spot while driving or when preparing to reverse out of parking spots. The vehicle also offers other advanced features, including Adaptive Cruise Control, Forward Alert with Collision Mitigation, Roll Stability Control and an Electronic Stability Program that works with traction control to help the driver stay in control. To reduce parking anxiety, Active Park Assist enables drivers to parallel park hands-free, requiring only accelerating, shifting and braking from the driver. "This engine line-up demonstrates Ford's commitment to offering the power of choice to customers in different markets with different needs and preferences," said Worthington. "We've selected the engine technologies from Ford's global powertrain range that deliver the best combination of performance and efficiency to meet and exceed the demanding requirements of SUV customers." The new Ford Everest stands apart with a bold, sculptural design that communicates its impressive capabilities and advanced smart features, while the robust front end with signature LED daytime running lights and wide stance make for a powerful presence on the road. The chiseled and technical design is also highly efficient - extensive aerodynamic testing led to an exterior that seamlessly melds form and function. The new Ford Everest's bold exterior presence is paired with a modern interior that makes use of refined materials and emphasizes horizontal lines to create a comfortable, harmonious environment for up to seven adult occupants. Interior features balance ride comfort with ultimate practicality, including a large moon roof, a convenient powered liftgate, more than 30 cleverly designed stowage spaces, multiple power outlets in the first and second rows, and flexible seating and cargo arrangements - including fold-flat second- and third-row seating - to achieve a perfect balance between passenger demands and packing efficiency. To ensure exceptional cabin quietness, Ford equipped the new Ford Everest with Active Noise Cancellation technology in addition to optimizing cabin sealing and sound absorbing materials throughout the vehicle. Similar to the systems used in noise-cancelling headphones, Active Noise Cancellation uses three strategically placed microphones inside the cabin to detect and measure sounds. A smart control module instantaneously generates opposing sound waves, which are then fed through the Everest's audio system to cancel out unpleasant noises. The result is a quiet interior that lets the driver comfortably speak with third row passengers without shouting. "With its safe and smart features, a refined interior and incredible on-road and off-road capabilities, the new Ford Everest sets a new standard in the medium SUV segment and represents a compelling addition to our global lineup of SUVs in Asia Pacific," said Worthington. "Taking advantage of our global design and development expertise, and our proud heritage in the utility segment, we've created a vehicle that goes far beyond customer expectations." The new Ford Everest will be manufactured at AutoAlliance Thailand in Rayong, Thailand, for ASEAN markets. In China, the new Ford Everest will be manufactured by Ford's Jiangling Motors Corp (JMC) joint venture at the JMC Xiaolan Plant in Nanchang, China, and distributed through JMC's Ford-brand network of dealers. The new Ford Everest redefines what an SUV can be, offering unmatched capability and versatility to answer customers' most demanding requirements on and off the road, while delivering a refined, comfortable vehicle that embodies Ford's fun-to-drive spirit. Rugged body-on-frame construction, intelligent four-wheel drive and a smart suspension system are some of the key components that enable the new Ford Everest's confidence in navigating challenging terrain. Advanced smart and safety features - including a number of segment-first driver-assist technologies - make it one of the smartest SUVs on the road, while still living up to the most demanding requirements of an SUV. 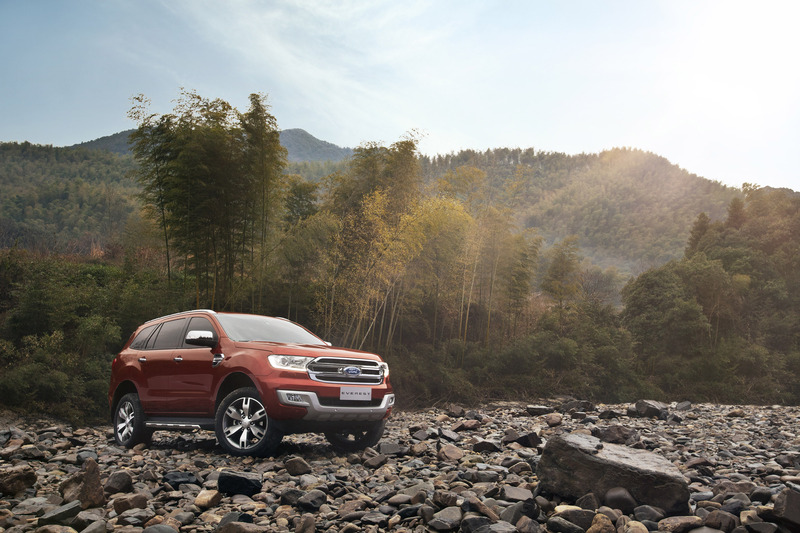 "Whether you're driving on a road, a trail or far off the beaten track, the new Ford Everest will give you the confidence and capability to tackle it all," said Trevor Worthington, vice president, Product Development, Ford Asia Pacific. "With smart systems designed to keep you in control both on- and off-road, the Ford Everest is filled with purpose-built technology that makes it a uniquely capable SUV for our customers in Asia Pacific." To ensure the best possible combination of on-road refinement and off-road capability, the new Ford Everest is equipped with an advanced four-wheel-drive system offering Torque on Demand through an active transfer case. Using a smart electronic control system, the transfer case continuously adjusts the delivery of torque to the wheels with the most grip, maximizing traction in all driving situations, be it during inclement weather conditions, powering through challenging turns or transitioning from pavement to a gravel road. "The intelligent four-wheel-drive control system is linked into the vehicle's communication system and takes it into account to integrate many elements, like steering wheel angle and throttle input, to make sure torque is where the driver needs it at all times," Ian Foston, chief program engineer for the Ford Everest. "It's a smart and robust system that we've tested around the world in extreme conditions to guarantee durability in even the most challenging environments." Faced with the task of pairing rugged off-road toughness with a comfortable and refined driving experience for all settings, Ford engineers created an SUV that makes use of smart technologies, advanced suspension, and powerful and efficient powertrains to help drivers reach their destinations, no matter how extraordinary. 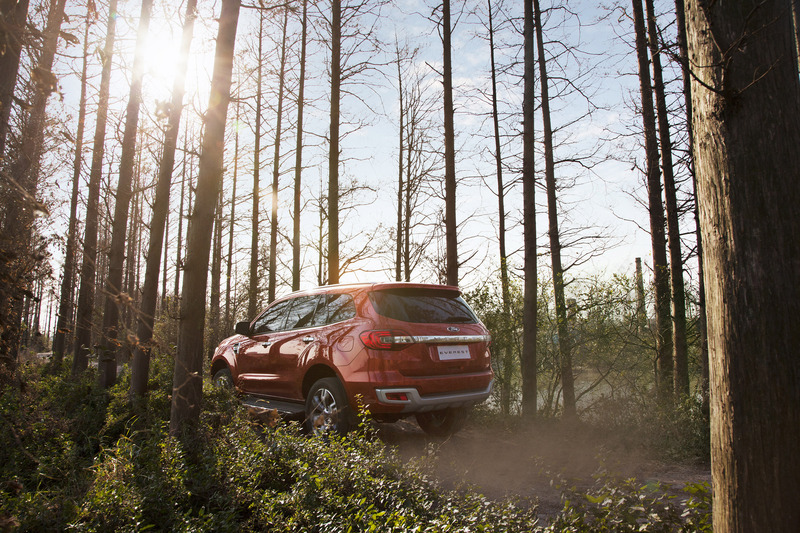 The off-road capabilities of the Ford Everest are enhanced by a Terrain Management System (TMS), which allows the driver to choose between four different settings on the fly - Normal, Snow/Gravel/Grass, Sand and Rock - for optimal performance in all conditions. Drivers can also lock the transfer case in low-range four-wheel drive mode for increased control in difficult terrains. Each TMS setting affects throttle response, transmission, the four-wheel-drive system and traction control - including an electronic locking rear differential - allowing the driver to navigate challenging terrain with confidence. The vehicle displays the current TMS mode, torque, and vehicle pitch and roll in the instrument cluster, providing another layer of driver involvement to the off-road experience for enthusiasts who want to track their performance. Even in normal mode, the TMS automatically adapts to maximize traction during everyday driving conditions, delivering torque to the front wheels when necessary to minimize wheel slip. The Snow/Gravel/Grass setting upshifts early and downshifts later to keep RPMs low, contributing to more predictable control on slippery surfaces. The setting also reduces gas pedal sensitivity to give drivers finer control over acceleration. Sand mode gives drivers aggressive torque transfer and allows wheels to slip more to better maintain momentum, helping drivers avoid getting bogged down in sand. An aggressive shift schedule also helps to maintain momentum by avoiding upshifting when the throttle is lifted and downshifting early when brakes are applied. Increased pedal sensitivity makes the engine more responsive to small foot movements when driving on beaches, dunes and similar terrain. Rock mode lets drivers traverse rocky terrain with aggressive torque transfer to tackle the most extreme off-road environments, and reduced gas pedal sensitivity for more precise control. The setting holds first gear for low-speed control, and fights off wheel slip to keep traction where the wheels need it most. 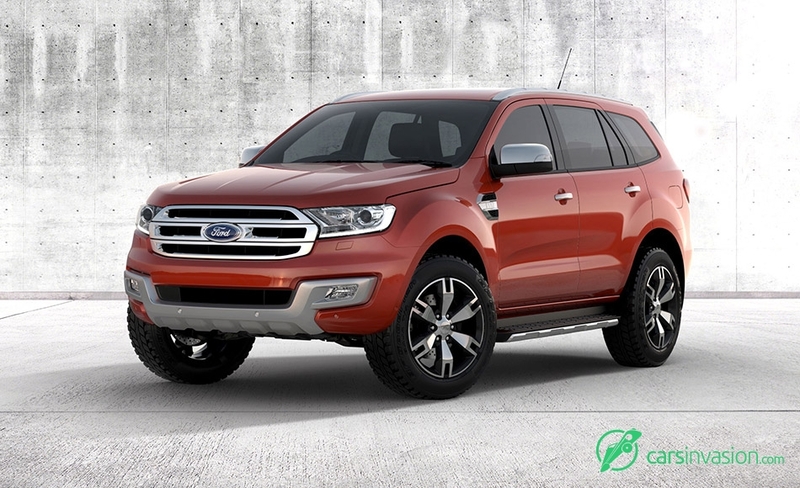 The rugged off-road requirements of the new Ford Everest demanded a rear suspension up to any task, while still delivering a comfortable, smooth ride on streets and highways. A solid rear axle with a Watt's linkage maximizes strength and ground clearance while providing stability and agile, predictable handling. Coil springs at the front and rear provide an unsurpassed level of ride comfort, ensuring a refined ride for all occupants - whether seated in the first, second or third row. Drivers can also manually engage the electronic Locking Rear Differential (eLRD) for increased traction while traversing extreme terrain, and, thanks to the active transfer case, can select between high and low range four-wheel-drive mode to optimize on- and off-road operation on diverse terrain like sand, snow or slippery rock surfaces. On steep descents in low range - engaged manually or through the TMS - a locking torque converter provides effective engine braking. 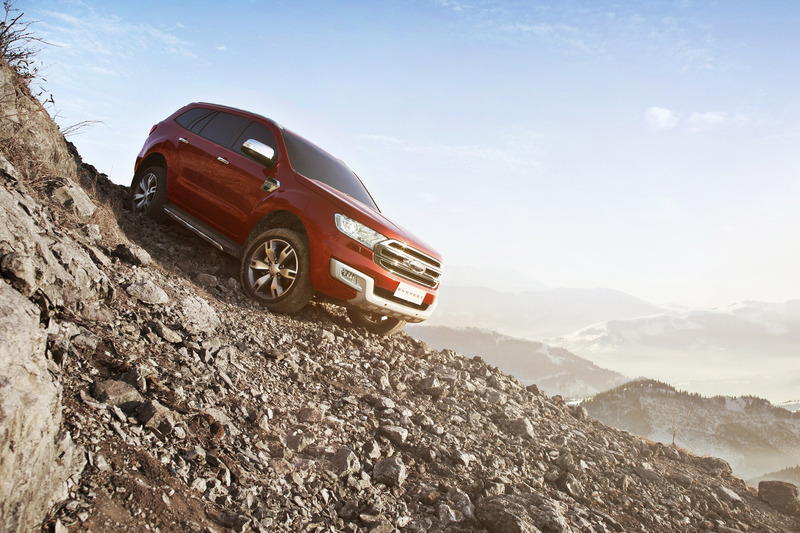 To further help drivers climb and descend challenging hills, the new Ford Everest comes equipped with Hill Ascent Control and Hill Descent Control. When the driver engages these modes with the push of a button, the vehicle will climb or descend even steep slopes at a steady pace without requiring driver input on the gas or brake pedals, allowing the driver to focus on steering through the challenging terrain. And when starting off on a steep hill - whether facing upward or downward and whether on- or off-road - Hill Start Assist holds the vehicle for up to three seconds while the driver's foot moves from the brake to the gas, giving added peace of mind. 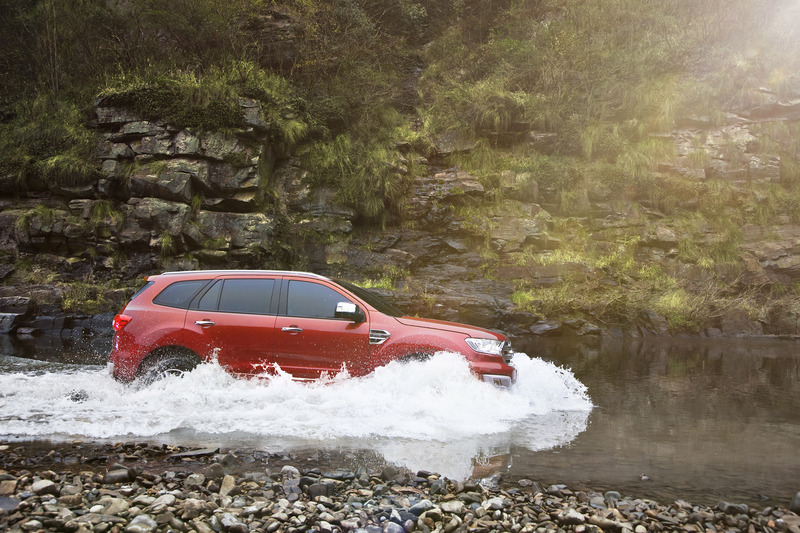 With its leading off-road credentials, drivers can take confidence in the Ford Everest's best-in-class 225 mm of ground clearance and its ability to wade through water as deep as 800 mm, deeper than any competitor. An approach angle of 29 degrees, a 21-degree ramp-over angle and a departure angle of 25 degrees also contribute to the vehicle's ability to take on difficult terrains with ease. Serious work requires serious capability, and the new Ford Everest delivers class-leading load carrying and towing capacity, in markets where towing is permitted. With a best-in-class cargo payload of up to 750 kg, roof payload of up to 100 kg, and 3,000 kg in towing capacity, the Ford Everest can take on even the largest jobs. When towing, Ford's Trailer Sway Control technology uses selective braking and engine management to mitigate unwanted trailer movement. Combined with Roll Stability Control, which applies the brakes and reduces engine torque when it detects a potential rollover situation, it contributes to the ease and comfort of driving the Ford Everest, especially with a heavy trailer. Inside the passenger cabin, more than 30 cleverly designed storage compartments ensure there's a place for everything. The capabilities of the new Ford Everest are driven by a range of refined, powerful and efficient engines: the latest generation of Ford's tried-and-tested four-cylinder 2.2-liter and five-cylinder 3.2-liter Duratorq TDCi diesel engines, and a new 2.0-liter EcoBoost petrol engine. Fitted with an upgraded turbocharger, injection system and exhaust-gas recirculation system to improve energy efficiency, the 2.2-liter Duratorq TDCi engine offers excellent engine performance. With projected class-leading fuel economy and carbon-dioxide emissions, the engine offers customers a compelling mix of efficiency and responsiveness. For maximum power and torque without sacrificing fuel efficiency, Ford will offer a five-cylinder 3.2-liter Duratorq TDCi diesel engine. Both diesel engines can be mated to a robust six-speed manual transmission or Ford's tried-and-true 6R80 six-speed automatic transmission with SelectShift manual mode. The six-speed manual transmission provides crisp and precise shifting, with an upshift indicator in the instrument panel to help drivers achieve the best possible fuel economy. The automatic transmission - the same transmission proven in millions of Ford F-series trucks around the world - has been carefully calibrated for the new Ford Everest to improve refinement and efficiency. Ford will also offer the new Ford Everest with a new twin-scroll 2.0-liter EcoBoost petrol engine with projected best-in-class fuel economy and carbon dioxide emissions. The advanced direct-injected turbocharged engine combines power and responsiveness, punching above its weight and offering more power than a conventional 3.5-liter V6 engine. Paired to the 6R80 six-speed automatic transmission, the 2.0-liter EcoBoost engine provides smooth and refined power delivery. "Whether equipped with the latest generation of EcoBoost technology or one of our proven Duratorq diesel engines, we've created a powerful, rugged and capable SUV with stunning design and high levels of refinement," said Worthington. 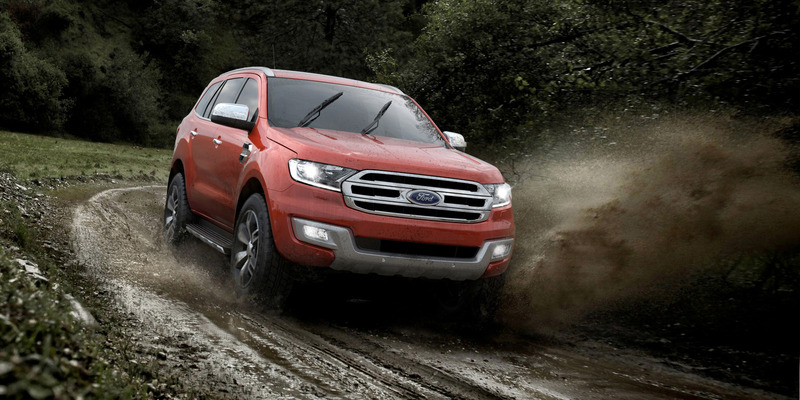 "Most importantly, the new Ford Everest is a thrill to drive. It's the complete package." Developed on the foundation of Ford's SUV heritage and Built Ford Tough credentials, there will be no mistaking the new Ford Everest when it arrives on the roads of Asia Pacific next year. The seven-seat SUV's wide stance and bold front end exemplify the vehicle's capability and impressive off-road credentials, while the chiseled, sculptural curves of the exterior hint at the refined interior within. "Looking at the Everest, consumers know what they're getting at a glance - an exceptionally capable vehicle with an unmatched level of comfort," said David Dewitt, exterior design manager, Ford Asia Pacific. 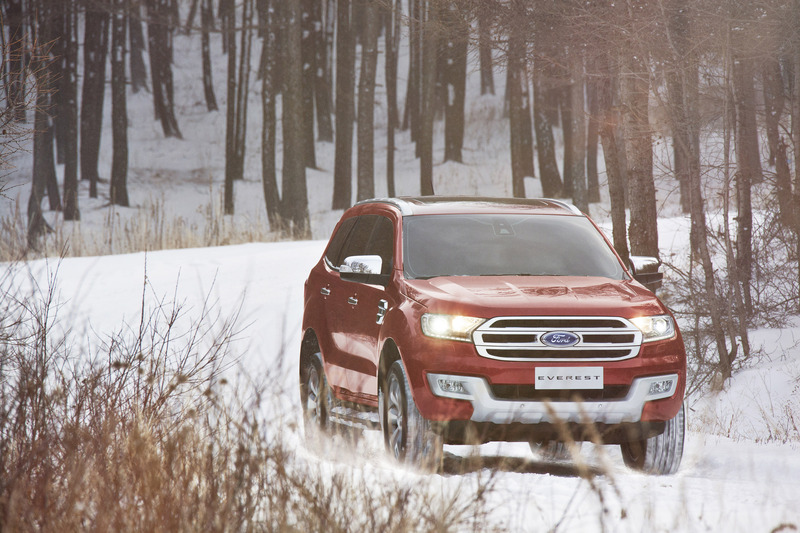 "The new Ford Everest goes beyond anything we've seen before in this segment." Following extensive research into markets and consumer preferences - the most research ever conducted for a vehicle developed by Ford in Asia Pacific - Ford created a tough and powerful off-road SUV packed with modern features, a comfortable, carlike interior, and smart, sophisticated design. "Customers told us they wanted an SUV that balances off-road toughness with a refined, comfortable interior, and we listened," said Dewitt. "This vehicle reflects what the consumer wants, inside and out." The design of the new Ford Everest was led by Ford's global Design Centre in Australia, drawing on Ford's global 50-year SUV heritage and its extensive expertise in the utility segment. The new Ford Everest's unshakable toughness and technological capability is embodied in its rugged yet refined appearance, delivering a bold, modern design that reflects power and ultimate control on the road. "The new Everest's exterior is a unique mixture of modern sensibility, functional design and classic Ford cues," said Dewitt. "Ford has been designing SUVs for nearly 50 years, so we were able to draw from that heritage and leverage our collective knowledge. 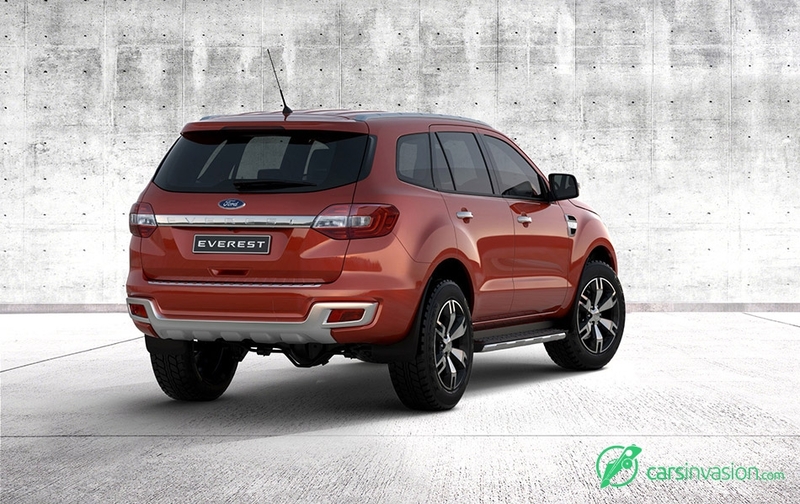 Every line on the surface of the Everest visualizes its ruggedness and capability, while delivering a modern, sleek vehicle that is unmistakably a Ford." 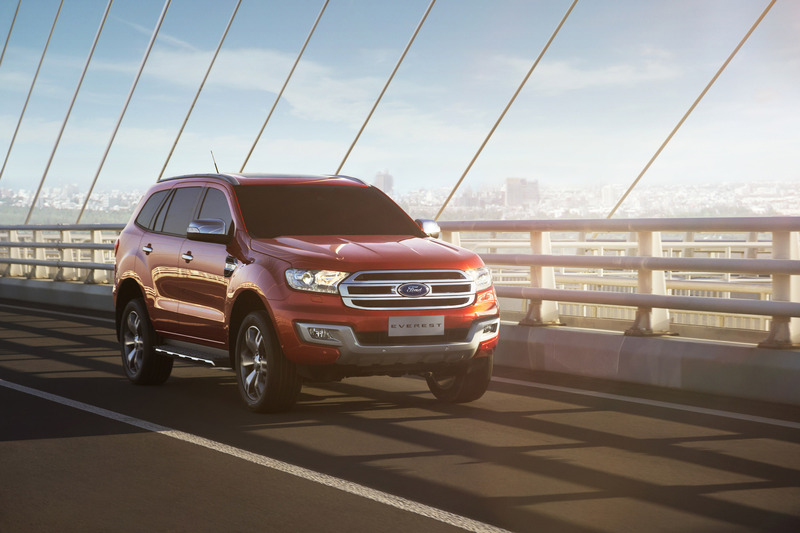 At first glance, Ford's design DNA is most visible in the bold, inverted trapezoidal grille that firmly establishes the new Ford Everest as a member of the global One Ford family of vehicles. The muscular hood, integrated headlamps with signature LED daytime running lights and front bumper visualize the vehicle's power and rugged capability. The headlamps connected to the grille help create a unified, horizontal design theme that gives it a strong presence on the road. The new Ford Everest's headlamps wrap around the grille's edges for a technical, robust look that helps to communicate the vehicle's functionality. From the grille, the lamps are chiseled back in a sweeping design that projects a modern and aerodynamic appearance. At the lower half of the front end, an integrated bumper connects to the fog lamps and carries on the horizontal theme, giving the vehicle a proud and modern look. The chiseled and refined theme continues through the vehicle's sides, where designers eschewed superfluous details. "From the side, the Everest appears sculptural, without sacrificing its robust, bold nature. The large, integrated wheel lips are surfaced and executed in a very refined way," said Dewitt. "Where there are technical details, they're balanced with sleekness and sophistication." Prominent LED tail lamps that recall chiseled design details throughout the vehicle sit over a negative scallop at the rear, extending a sense of sculptural refinement and avoiding the square, flat look of a traditional SUV liftgate. Underneath the tailgate, a rear undershield echoes the front of the vehicle and gives the Ford Everest a firmly planted look. Blending sophisticated design and engineering, the proud and chiseled body also maximizes function: Key exterior design elements, such as integrated aerodynamic "kickers" flanking the rear window, give the new Ford Everest unsurpassed aerodynamic performance, with a best-in-class drag coefficient of 0.389. A 3D-formed aerodynamic front undershield similarly routes airflow under the Ford Everest as efficiently as possible, helping it to slip smoothly through the air. Inside the new Ford Everest, a modern interior redefines the level of comfort consumers can expect from a tough and capable SUV. Designed using premium materials and advanced fabrics, and boasting the latest in-car connectivity technologies, the exceptionally quiet interior offers features that make life on the road more comfortable, including a large two-panel moon roof above the first two rows of seats, and heating, ventilation and air conditioning (HVAC) vents for each row. The horizontal theme from the exterior continues inside the vehicle, with lines running across the dashboard and instrument panel, framing the entertainment system at the center and imparting a roomy and commanding feel. "Sitting in the driver's seat, you see a strong horizontal line that goes from one door, through the instrument panel, and on to the other door," said Maurizio Tocco, interior design manager, Ford Asia Pacific. "Outside, the width gives you a sense of stability. Inside, it gives you a sense of spaciousness." The new Ford Everest places a premium on space, comfort and convenience for all occupants, no matter where they sit. In the front, available eight-way adjustable heated power seats help both the driver and front passenger fine-tune their seating position. A roomy second row - which has its own heating and air-conditioning controls - features reclining seats with a 60/40 split. The comfortable third row has a 50/50 split, and can be flipped down with the touch of a button to create extra cargo space. Interior designers paid close attention to details, ensuring that no unnecessary elements clutter customers' interactions with the vehicle. 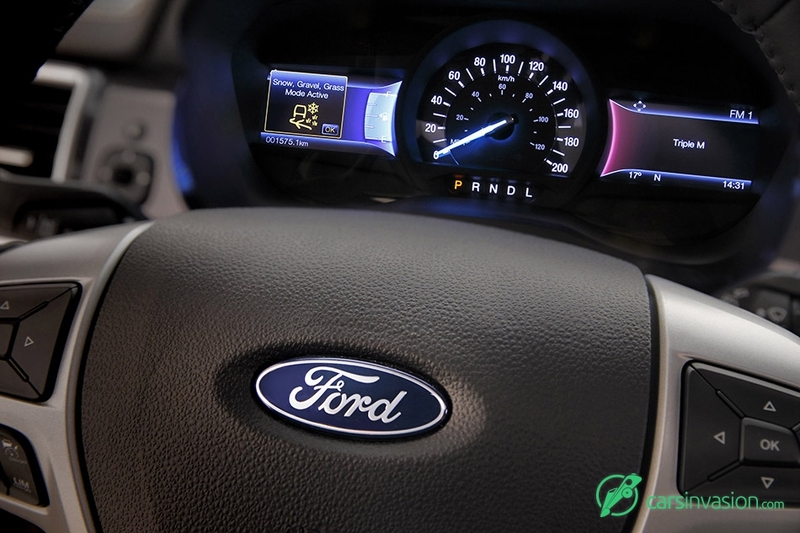 All facets of the vehicle's control and infotainment system - including the 8-inch color touchscreen of SYNC 2, Ford's in-car connectivity solution - are comfortably within reach of the driver and complemented by meticulous craftsmanship. "We treated every aspect with the same level of importance. Every detail in the Everest is refined - from the instrument panel to the luggage compartment - and is crafted with a level of detail more like a premium watch than a tough SUV," said Tocco. "The end result is a subtle and truly exceptional experience for drivers and their passengers." For interior design elements that occupants are most likely to touch and interact with, the new Ford Everest employs more refined materials, such as a choice of leathers and advanced fabrics for seating, soft materials on handles and door trim, and chrome highlights around the air register rings. "Using a really elegant, satin chrome on the air registers allowed for reflections and highlights, but didn't have the dainty, thin feel of a shiny, bright chrome," said Tocco. "When we had really bold shapes, we used more refined finishes." Complementing the sophisticated design of the interior - and providing a welcome refuge from noisy city streets and extreme outdoor environments alike - the new Ford Everest also features one of the quietest cabins in its class. Through the use of three microphones embedded in the headliner, Active Noise Cancellation generates sound waves through the vehicle's sound system that cancel out ambient noise for a startlingly quiet interior environment. Noise, vibration and harshness are further limited by hydraulic engine mounts and the extensive use of sound-deadening materials throughout the vehicle. 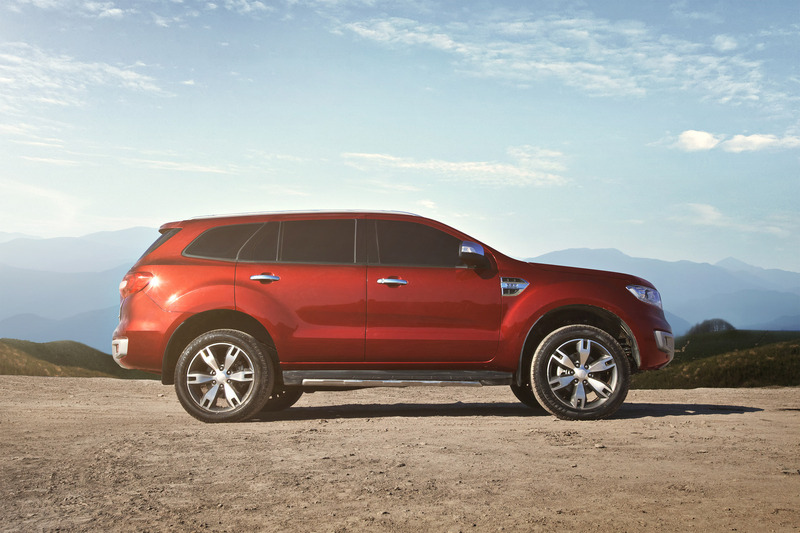 Careful aerodynamic design ensures that the Ford Everest provides a quiet ride even with the windows down. Extensive modelling of the aerodynamic interaction between wing mirrors and the sides of the vehicle led to a body shape that minimizes the throbbing sound that accompanies driving at speed with windows lowered. 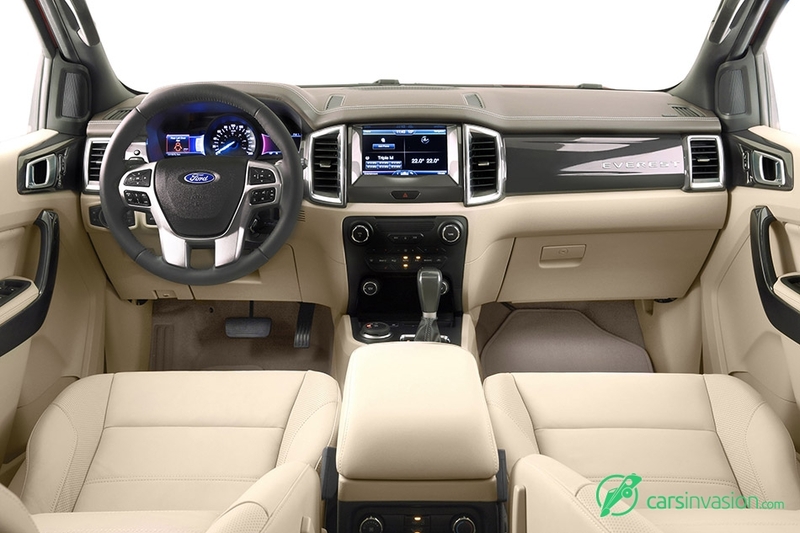 The interior of the new Ford Everest was also designed for practicality in any setting. "The Everest interior has a higher level of craftsmanship than you would expect from such a rugged SUV, but at its core it's a functional and practical space," said Tocco. "It's a smart, comfortable interior cleverly built on a capable and flexible framework." 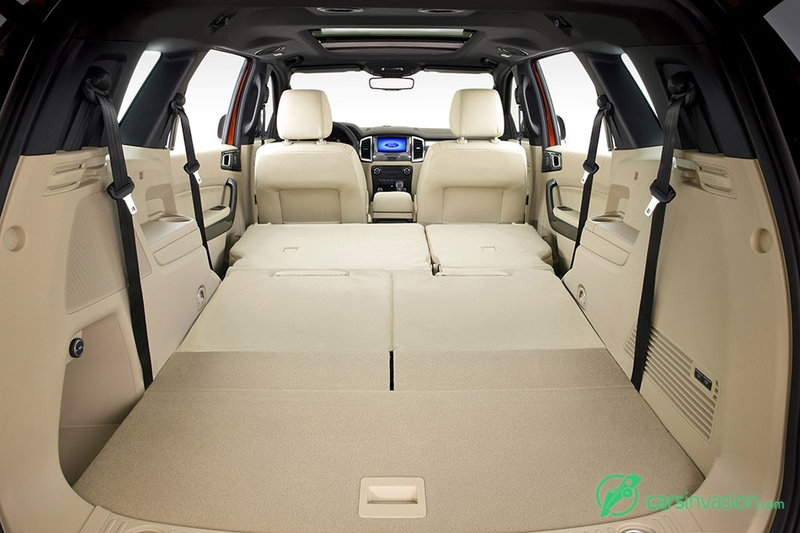 More than 30 stowage spaces totaling 48 liters ensure all occupants have sufficient space to store everything they need. Whether it's a weekend on the golf course or a long work trip, the new Ford Everest is prepared. A recess in the rear cargo area was specifically designed to fit wide items such as golf bags without infringing upon passenger seating space, and the glove box is capable of safely stowing a 16-inch laptop computer. Laptops can be charged through a 240-volt power outlet in the second row, while 12-volt outlets in the front console and in the second row let drivers and passengers charge multiple gadgets at the same time. Another 12-volt outlet at the rear of the Ford Everest can be used to run devices like air compressors when camping. For more cargo space, customers can fold the power-fold 50/50 split third row at the touch of a button. When it comes time to move or carry other large items, the second row also folds for a completely flat floor and 2,010 liters of interior stowage space - all conveniently accessible with Ford's Power Liftgate system. Fully loaded with seven passengers, the new Ford Everest can support a best-in-class payload of 750 kg, and has an additional roof load capacity of up to 100 kg - enough to embark on any kind of journey. 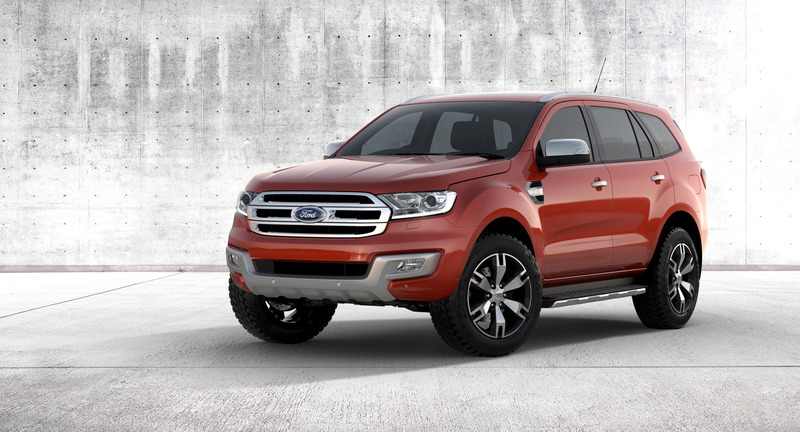 "When you look at the new Ford Everest, its functionality is communicated through its aesthetics," said Dewitt. "It's a perfect balance between functionality and aesthetic harmony, wrapped up in a package that looks equally at home in the city and at the ends of the earth."